We recently conducted a demonstration of Dust Stop®’s ability to effectively control dust emissions of particulate matter. This demonstration took place in the COQUECOL Free Zone yard in the Municipality of Buenaventura, Valle Del Cauca, Colombia. The goal is to measure the difference in volume of coal piles with and without Dust Stop® application. Five samples were organized in 1.4m cubes which were open at the top and at the front. 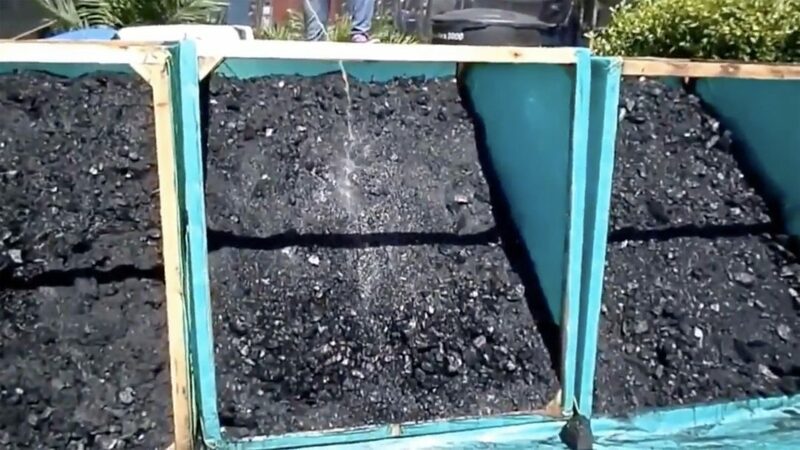 Coal was then placed into each cube at an approximate slope of 45%, effectively filling half of the volume of the cube. Three samples were sprayed with Dust Stop® at different dilution rates in water to show the performance of Dust Stop® at controlling dust emissions. Cypher Environmental is a global leader and provider of environmentally friendly solutions. It is our goal to produce and distribute products that are not harmful to the environment and to the areas in which they are used in. Cypher Environmental’s Dust Stop® is an environmentally friendly solution for dust suppression and dust control. Dust Stop®’s primary use is to provide dust control on roads and unpaved surfaces but can also have erosion control and soil stabilization properties. Mine sites and haul roads around the world have benefitted from Dust Stop®’s easy application and long lasting results. Distributed in both liquid and powder forms, the products were designed with ease of mixing and application in mind. The two forms of the product makes it highly versatile and more useful across varying environments and usage.